The results of the Iowa caucuses won't be known until late this evening, but we already know the big winner: Senator Bernie Sanders. The 24/7 chattering classes focus on whether Sanders' young and new voters will turn out, whether his voters' enthusiasm can match Clinton's organization, whether the blizzard will hit before or after the caucuses. But Iowa isn't about who wins the most delegates; it is about who gains momentum and legitimacy. Whether he wins or loses in the final caucus count, Sanders is already assured of coming out of Iowa with momentum and legitimacy. The "fringe" candidate is for real. The prohibitive favorite has been pushed to the wall. When Sanders first announced, he was universally dismissed as irrelevant, an unknown self-described "democratic socialist" who would strain to live up to the results of the boutique campaigns of Al Sharpton or a Dennis Kucinich. Hillary Clinton had all of the money, unprecedented establishment support, the best operatives, and wisely was building an unprecedented ground operation in Iowa. She led Sanders in a February 2015 NBC poll of Iowa voters by 68 percent to 7 percent (Biden has 12 percent). Sanders, at best, would provide a frisky trial-run pony, giving Clinton practice in debates, helping the campaign exercise its muscle, without forcing it to raise much of a sweat or spend much of its lucre. That was then. Since then, Sanders has surged dramatically, running neck and neck in Iowa and capturing the lead in New Hampshire. 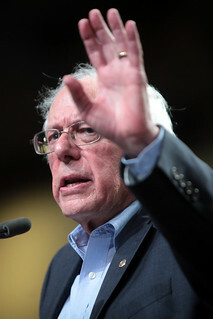 He's set new records in small donations, proving that a populist candidate can be financially competitive in a national presidential race without support of the Democratic Party's deep pockets, largely located in Wall Street, Silicone Valley or Hollywood. His bold populist agenda -- break up the big banks, Medicare for all, $15 minimum wage, free public college and more -- has proven its appeal, with Clinton forced to move his way. Sanders, the 73-year-old grandfather, has electrified young voters. The press has focused on polling that shows Sanders with wide leads among the young and new voters, while Clinton's strength is among older and experienced caucus-goers. The Sanders campaign faces immense turnout challenges as a result, but he's demonstrated that millennials -- the largest and most diverse segment of the population -- are looking beyond the offerings of socially liberal, corporate Democrats for a bolder and more populist politics. Sanders also appeals, not surprisingly, to the party's liberals, professionals, technical workers and activists. But Clinton is also very popular among liberals and professionals. The Jacobin's Matt Karp offers an additional insight into the Sanders coalition: "A good deal of evidence suggests that Sanders has assembled a rather different kind of voter coalition than any primary challenger of the past generation -- that he is the rare 'progressive' candidate who can actually win over white working-class voters." If these trends hold up, they will be a stark contrast to the support garnered by earlier "insurgent" candidacies of Barack Obama or Bill Bradley or Howard Dean. Their appeal was largely among affluent, young professionals. Clinton's comeback in New Hampshire in 2008 was fueled by the support among working people, particularly women. Obama cleaned up in voters making six figures or more. And this suggests that Sanders' appeal comes from his integrity -- his independence of big money and willingness to take it on and call it out -- and his platform. It suggests that at least in Iowa and New Hampshire, working class voters are tuning in on what he has to say. The last insurgent to put forth an agenda as bold as Sanders was the Rev. Jesse Jackson in 1984 and particularly in 1988. (Disclosure: I worked with Jackson on that campaign.) Jackson also championed universal health care, a living wage, empowering workers, challenged NAFTA, called for dramatic increases in public investment, and for curbing our interventionist foreign policies. Jackson's insurgency mobilized people of color, but gained increasing traction among working people, particularly union members. To date, the Sanders campaign has gained little traction among African-American and Latino voters, the former providing the core of Clinton's much-celebrated "firewall" in South Carolina. These are the very voters that fueled the Jackson insurgency. Sanders will clearly come out of Iowa and New Hampshire with momentum. He'll have the resources to be competitive. He'll have to introduce himself and his ideas, with little time to do so. But his platform will appeal if it gets heard. As Black Lives Matter and the Dreamers have shown, throughout the black and Latino communities, young organizers are impatient with their leaders, angry at conditions, and ready to force change. Generally, blacks and Latinos tend to vote cautiously, better the "devil we know." But these are not cautious times. The African-American and Latino middle classes were devastated in the Great Recession, and have had the hardest time recovering from it. From Ferguson to Flint, the afflictions imposed on these communities are getting exposed. As Sanders introduces himself, he may generate a surprisingly receptive response. Those, of course, are mere musings. But what Sanders has already won is very real. He's put forth a bold, populist agenda. He's challenged the grip of big money on our politics. And he's shown that his message can electrify the young and attract working people. In this, Sanders has already begun to shake the establishment, evidenced by increasingly vitriolic attacks on him and his ideas. Sanders is putting the powers that be on notice. This rigged system doesn't work for the vast majority of Americans. And the complacent politics of the establishment center offer no way out. The elites of both parties better figure out how to cut Americans a better deal -- or Americans will demand a new dealer.